Comedians Tom Allen, London Hughes and Matthew Crosby have all been signed up for BBC One’s new Saturday night ‘pop-up’ quiz show. 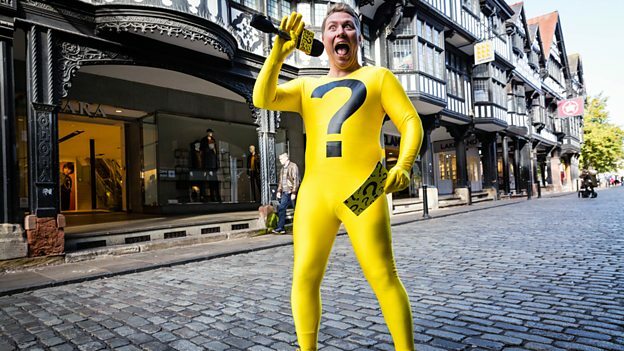 Ready Or Not, originally announced last summer, will involve a team of roving hosts who will pounce on the public in unexpected locations such as shops, restaurants, high streets and landmarks. Hughes hosts the ‘extreme quizzing’ section, ambushing tourists as they enjoy a day out in London – for example asking them question as they hurtle down London’s Orbit slide at the Olympic stadium. Pappy’s star Crosby is ’Surprisey Man’, popping up unexpectedly in random places such as a restaurant table, a water feature in a garden centre or under some bananas in a market stall to spring a quickfire quiz on unsuspecting members of the public. And Allen hosts a segment called Don’t Panic, setting up a gameshow behind people who are distracted by a fake market researcher. Other segments include The Lift, in which presenters Sam Nixon and Mark Rhodes transform an elevator into a gameshow studio; Crumpet The Talking Dog, in which a pet suddenly starts striking up a conversation; Quiz Me Quick, featuring presenter Laura Jackson on the beaches of Britain; The Gallery Headset, with radio presenter Pete Donaldson asking questions while people take an audio tour of an art gallery; and Question Mark in which actor Matt Ralph dons yellow lycra to hand out as many tenners as possible for answering his trivia questions. Ready Or Not will air on BBC One later this month. Six half-hour programmes have been commissioned from Remedy Productions by channel controller Kate Phillips.